Planning a trip to France? If so, you’re undoubtedly looking forward to some really amazing food. The whole concept of gourmet cooking — haute cuisine, to be correct — originates in France. The ingenious methods, the elegant sauces, and the artistry of French chefs is known all over the world. Let’s start out easy. 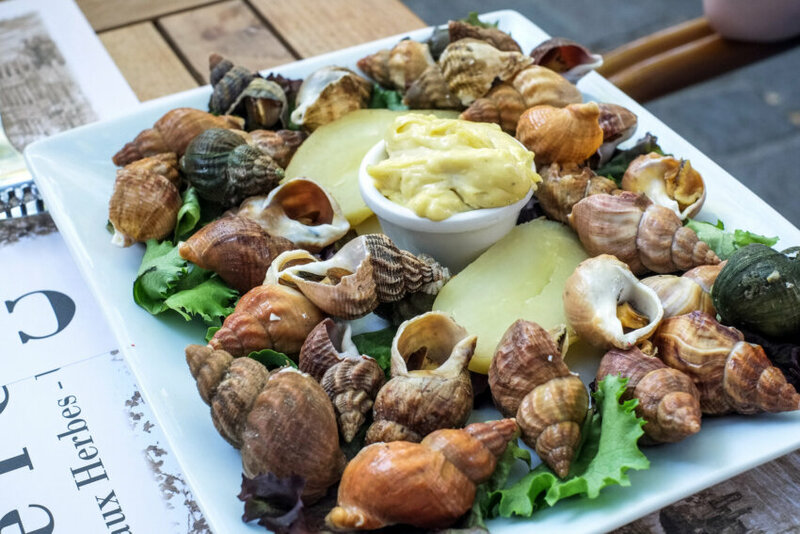 You can buy bulots from street vendors in Paris and all the seaside towns in France. Everybody has their own recipe for cooking them, and they’re all delicious. You have to work the little bulot out of its pretty shell with a special little pick. They taste a lot like clams, and they’re really fun to eat. Another not-too-scary dish that makes our top 10, pigeon does not taste like chicken. The meat is rich and dark, with a delicate texture and an earthy flavor that makes it really special. And who knows? 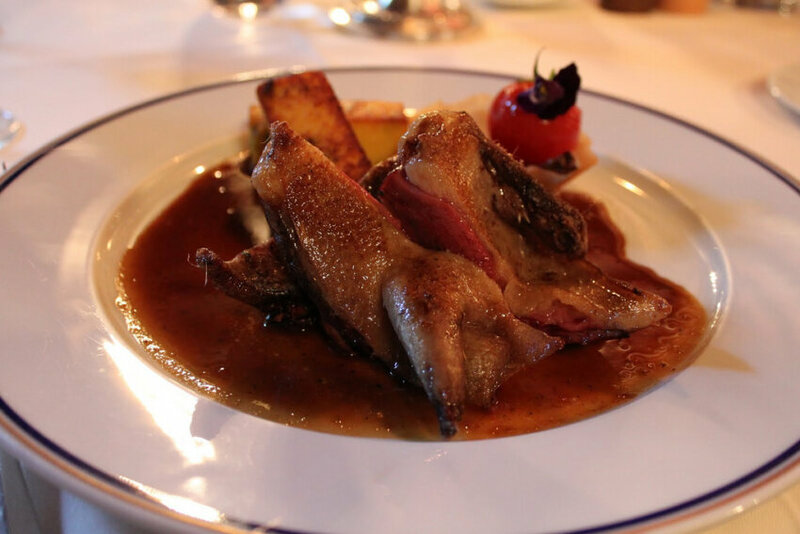 You might already have eaten pigeon — in the U.S. it’s called squab. Translated, this is smoked ox tongue. Tongue is cooked all kinds of ways all over the world. If you’ve already tried it barbequed or in a taco, you know how good it is. 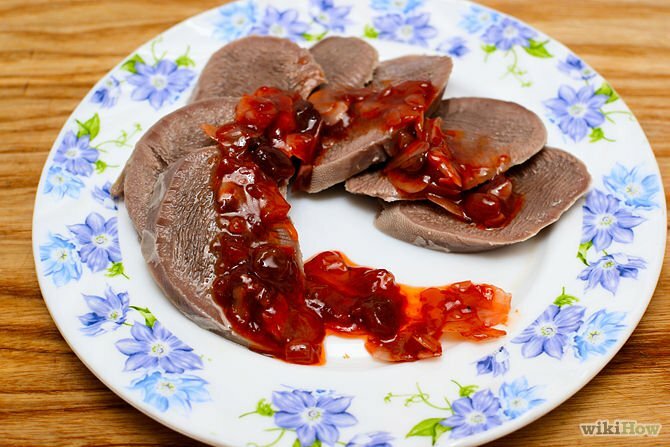 The flavor is very much like a lesser cut of beef, but the texture is much smoother — and in the right hands, ox tongue can be so tender that it absolutely melts in your mouth. You can get some incredibly fancy variations on this simple dish, including a luxurious Langue Lucullus at Benoit in Paris, where it’s stuffed with foie gras. Ah, now we’re getting somewhere. 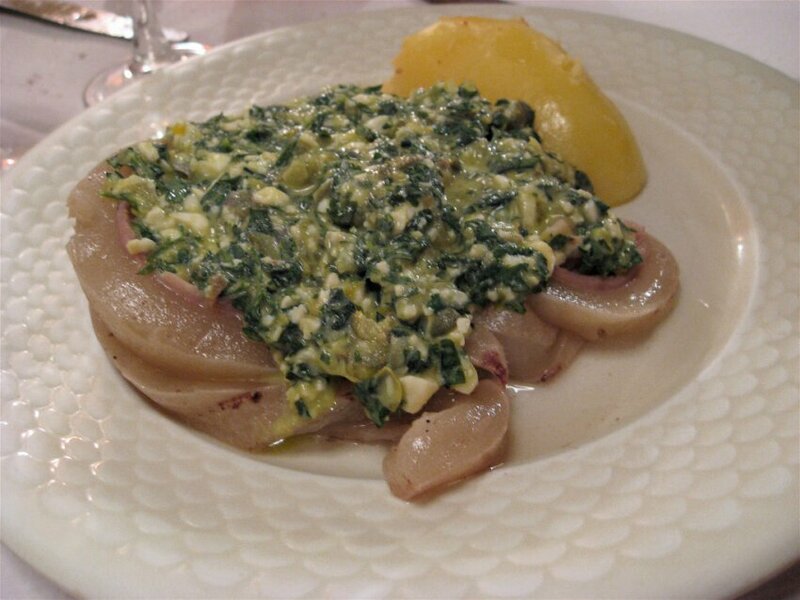 Tete de Veau is a seriously traditional dish. It’s made from parts of a calf’s head, boiled down and composed into a single piece. 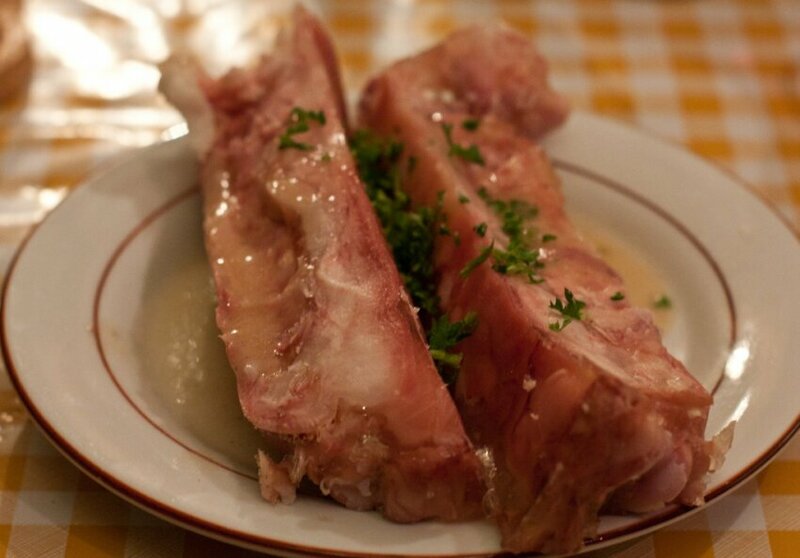 Tete de Veau is a little bit fatty and definitely gelatinous. The jelly-like texture and odd flavor might take a little getting used to — your best bet is to try it with a good sauce. It’s pictured here paired with a Gribiche sauce, which is a great choice. 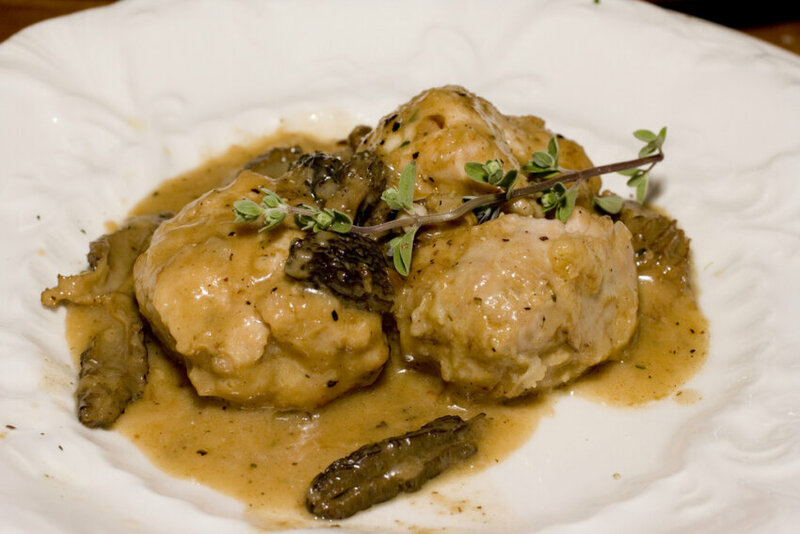 Ris de Veau is the pancreas of a calf — in English-speaking countries it’s called sweetbreads. The taste is very mild and a little like bacon, and the texture is absolutely silky and reminiscent of scallops. If you’re going to try the organ meats, this is the place to start. Tripes (in English, tripe) is an animal stomach. In France it’s most often veal belly. Soft and tender, tripes can be quite delicious, especially along with a big serving of boiled potatoes. For obvious reasons, make sure your tripes is coming out of a pristine kitchen, prepared by a really competent chef. The pork-eating world has voted, and the decision is unanimous — there’s just about no part of a pig that isn’t scrumptious. As proof, try some Pieds de Cochon (pig’s feet) while you’re in France. They’re a little bit greasy and gelatinous, but let’s face it — so is bacon. And they’re also fatty, porky, and totally yummy. The rich flavor is a lot like a ham hock, and like ham hocks, they make a great addition to soups and stews. 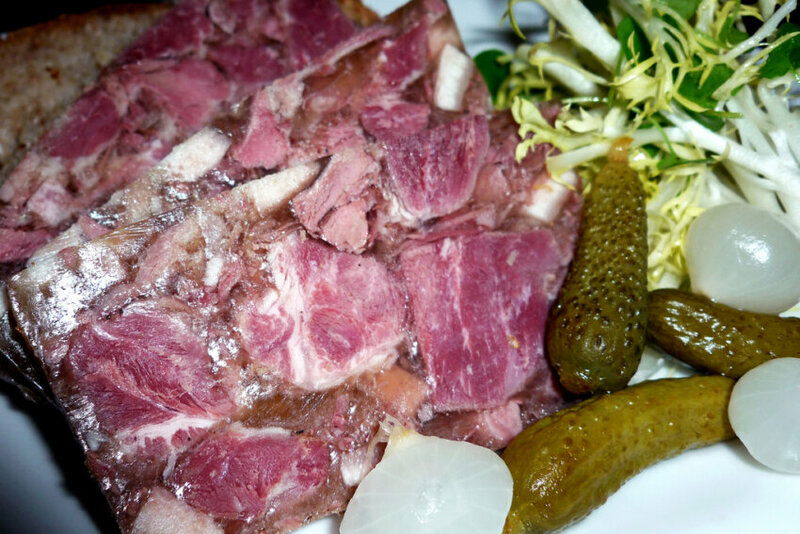 Fromage de Tete is head cheese, and you may have run into it before, if there’s a good deli near your home. Don’t be put off by the fact that it’s made from various goodies in and around the head of a cow. Fromage de Tete is awesome. The texture is kind of wobbly, like a really firm Jello. It smells a bit like a high-quality bologna — and tastes like a rich, spicy ham. Get past the odd texture and you’re in for a real treat. Boudin Noir is either blood sausage or blood pudding. In France it’s generally made with pork blood. To hold it together, they add lots of other ingredients — most commonly onions, bacon or fatback, apples, parsley, egg, cream, and seasonings. 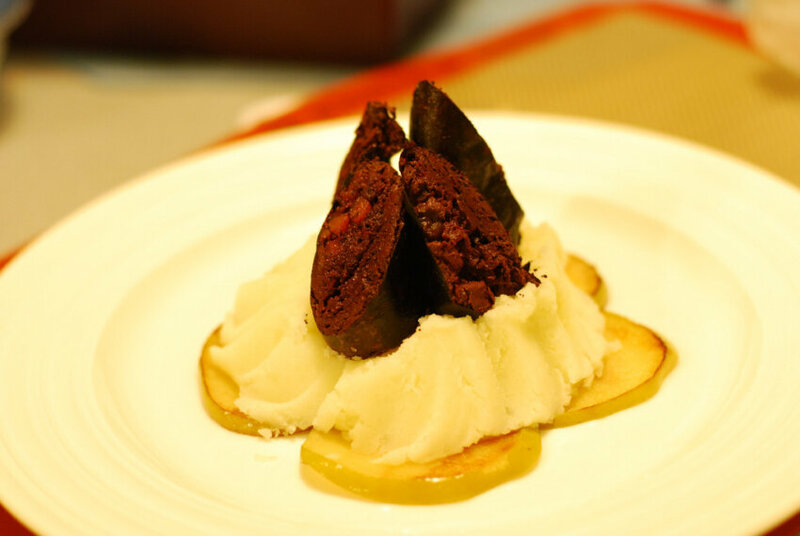 You’ll often find Boudin Noir served up on a plate with cooked apple and diced potato cooked with onion. This is a dish you’ll either love or hate. The texture is dense and somewhat gritty, and the flavor is rich and spicy with a strongly metallic aftertaste. 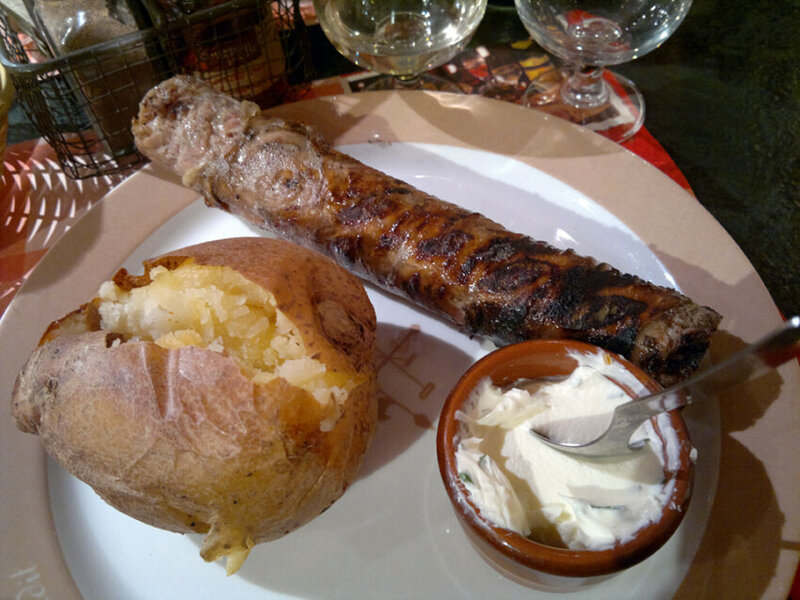 If you want to start an argument in France, ask two locals what they think of Andouillette. This controversial little sausage is another one of those love-it-or-hate-it dishes. 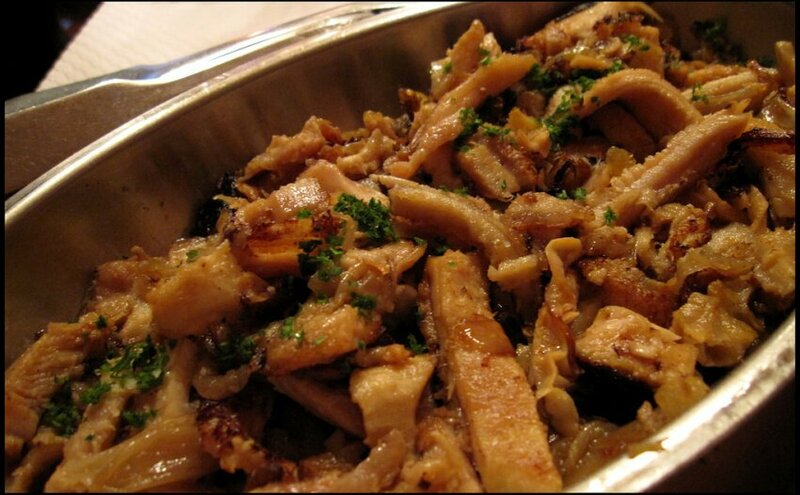 It’s made from tripe and chitterlings (intestines), usually either pork or veal. If you’ve eaten and enjoyed chitterlings, give Andouillette a try. The flavor is strong and earthy — and, like chitterlings, there’s certain amount of smell involved in the preparation and consumption of Andouillettes. Definitely an acquired taste, and certainly not for everyone. You might not have the stomach for all these foods, but try as many as you can! There’s no better way to get to know a country than by eating its traditional dishes — you’ll have some wonderful memories to bring home with you, and the chances are you’ll remember most of them as delicious.